In today's very busy world the need to commute from home to work has become even greater in distance as well as time. Motorcycles are more popular than ever for economic transportation, weekend enjoyment, or for those who just "love to ride". 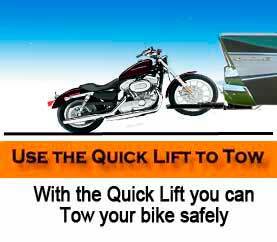 There is a need for an efficient method to transport your bike, whether it is a break down, flat tire, or "over indulging". 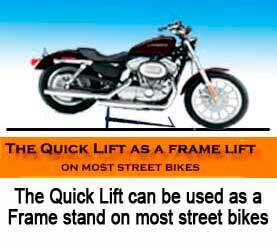 If you have the motorcycle Quick Lift you won't have to leave your bike or have some tow truck driver rudely chain it to his truck. Anybody with a receiver hitch or a place for a trailer hitch ball (adapter required) can tow you to town, home, or to the repair shop. 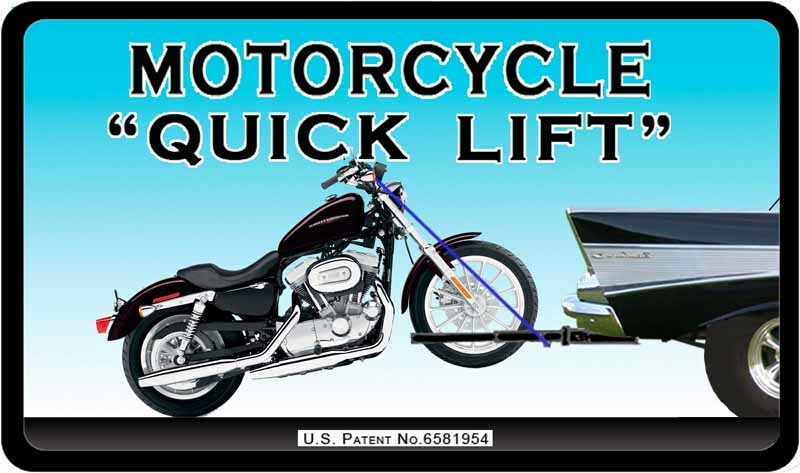 You can carry the motorcycle Quick Lift on your bike so you are able to receive help immediately! It even comes with a handy, heavy-duty storage bag.